“I selected Ramapo because of its reputable nursing programs and highly skilled dean and faculty, in particular, Professors Kathleen Burke, Elaine Patterson and Peggy Greene, to name a few.” – Ebony M. Samuel ’06 ,’10 graduated with her BSN and Master of Science in Nursing- Education, both from Ramapo College. For the last 10 years, Ebony has worked as a Registered Nurse in the specialties of Medical-Surgical, Neonatal Intensive Care, Nursing Education (academic and clinical settings) and Nursing Professional Development. She has received nationally accredited certification from the American Nurses Credentialing Center in Nursing Professional Development and is a recipient of the Magnet domain-Empirical Outcomes Nurse Excellence Award. 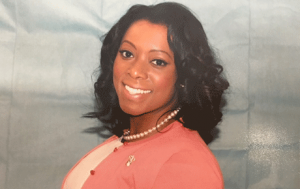 Ebony is an active member for the Consortium of New Jersey Nurse Educators, New Jersey Council of Magnet Organizations, and various councils within her organization. Ebony is a humanitarian who has extended her support along with Ramapo College in Sierra Leone, West Africa, and aspires to continue to support global healthcare. She currently works as the Lead Nursing Professional Development Specialist at a large healthcare system where she serves as the Chair of several committees and facilitates a HRSA grant- supported Nursing Residency Program, among many other responsibilities. Ebony looks forward to pursuing her doctoral degree in the near future.